Mid-Life Cruising!!! : New Battery System for Living Off the Grid! New Battery System for Living Off the Grid! When Ken & I thought of getting new batteries for Nirvana in order to anchor out most of the time, we had no idea how much there was to learn! Since owning Nirvana, we've had one starter battery & one house battery. 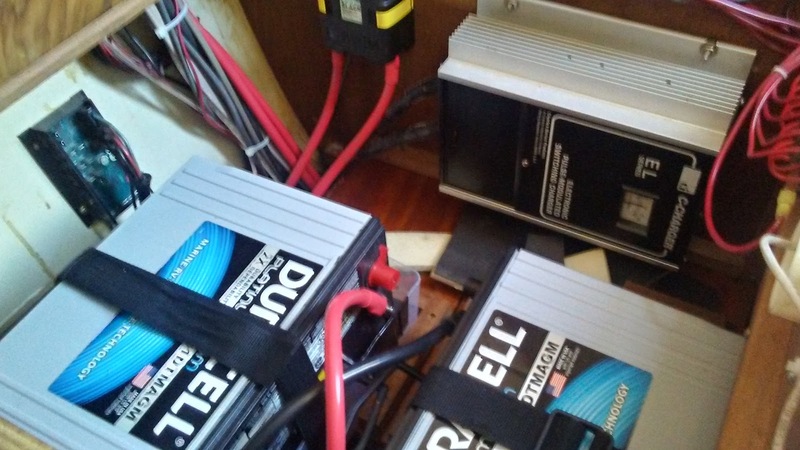 Since we've been in project mode and plugged in at the dock, we didn't need to rely on our batteries much. 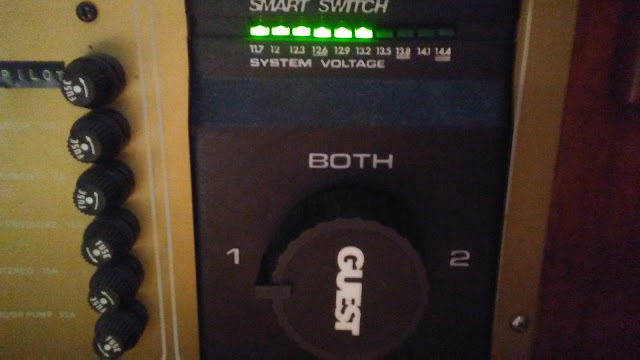 We just turned the main switch to "1" for the house bank and that was it. After reading the related chapters in Nigel Calder's "Mechanical & Electrical Manual" a dozen times, I realized there was a lot more to creating an "off the grid" system. (We highly recommend this book, and will be referring to it many times in the future, including when we add our solar panels soon). Ken had a basic understanding of batteries, but it was all foreign to me. There were so many things to consider .. not only the batteries, but the cables & terminals, the wire size, the alternator, the regulator, the isolator, the charger, the battery monitor .. whew! The first thing we needed to do was figure out how many amps we expected to use on a daily basis. Since we don't have a watermaker, we've replaced all of our lights to LED, and our 12v Engel fridge only draws 2 amps, we figured around 100-110 amps per day would get us by. The next step was choosing our batteries. 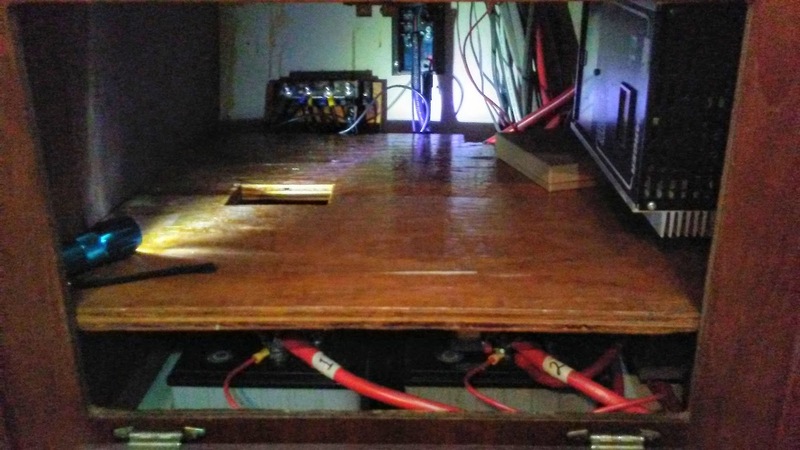 Although we only needed about 100-100 amps per day, we don't wanna drain our batteries below 50%, and we probably won't charge them to 100% daily .. meaning we needed to get as many amps as possible in our small space. We really didn't want to go below 300 amps in batteries. Golf cart batteries were a good option, but when faced with six of them it wasn't gonna work for us. After a fair amount of research, we decided on AGM batteries wired in parallel, specifically Firefly batteries. These batteries would fit our small space, and they have great reviews on fighting the problem of sulfation. However, after weighing the high costs of these hard-to-find batteries (they are often on back-order), we decided to continue searching for options. While researching our battery options, Ken tackled the easy stuff. He installed the Sea Dog switch panel that we ordered onto our navigation station. 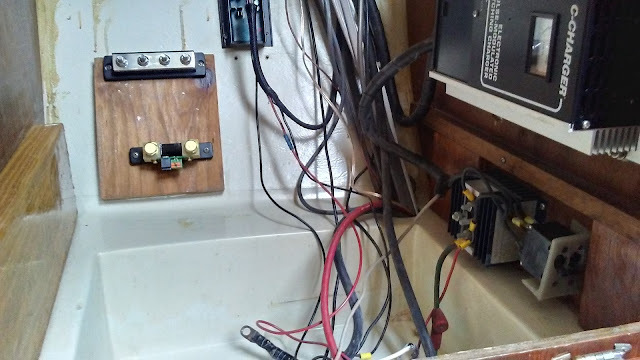 The new panel allowed us to add six circuits, which we used for our propane tank's solenoid, our Caframo fans, our new 12v outlets, television, Engel refrigerator, and one extra for a future item. 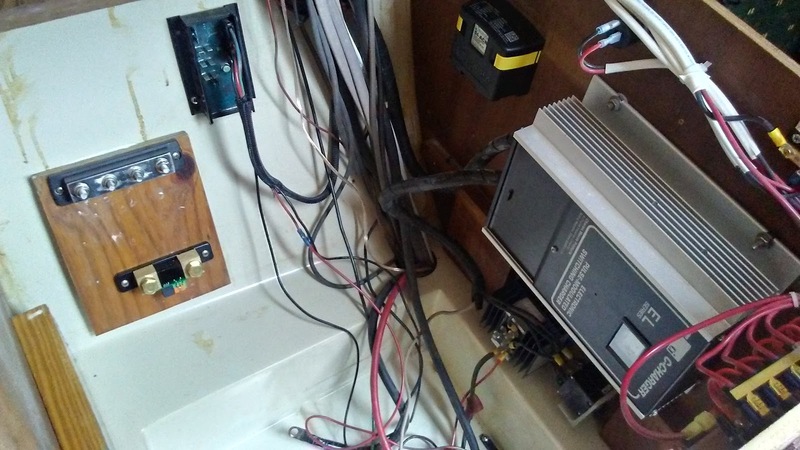 Ken then installed the Victron BMV-712 battery monitor onto our nav station. We'd heard good things about this monitor, and we were looking forward to hooking this up to our new batteries. We're happy with the location of these items, as they are easy to view & out of the way. We even have room for one more switch panel if we need it. After a long search, we finally decided on four Duracell Platinum Deep Cycle Group 31 AGM batteries ... three for the house bank & one for the starter bank. These batteries were at our local Sam's Club and are made by East Penn. They're pretty much the same battery as East Penn's Deka Intimidator, which was confirmed when I called East Penn. The woman I spoke with at East Penn was very helpful, and she even emailed me the installation pamphlet. These batteries have great reviews, and the Sam's Club price of $179 was quite a bit better than the Intimidator at $263 or the Duracell Platinum at Batteries & Bulbs for $265. Like all AGMs, these batteries can be placed on their sides. This was a big plus for us in order to store a total of four of these batteries in our little navigation station's battery area. We decided to add a shelf for two batteries laid on their side, and below would be two more batteries placed upright. Three of these batteries run in parallel would give us 315 amps for our house bank .. about 115 usable amps. The fourth battery would serve as our starter battery. 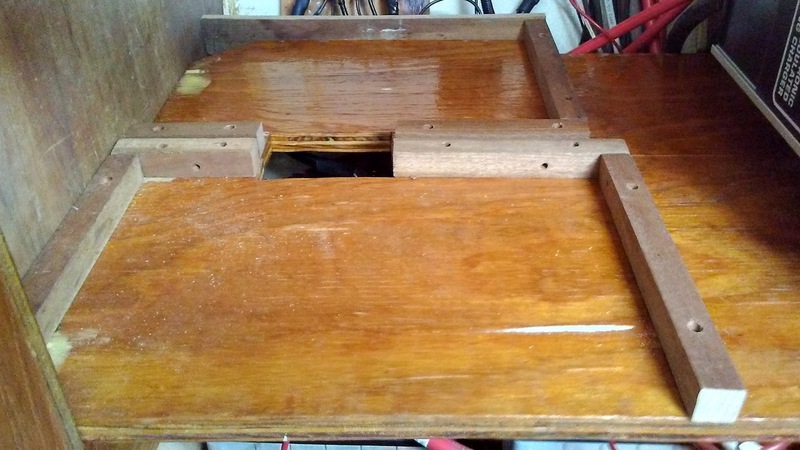 In order to install a shelf in our tiny battery area, Ken cut (and coated with epoxy) some wood for shelf supports. He then screwed the two side supports to the interior of the battery area. 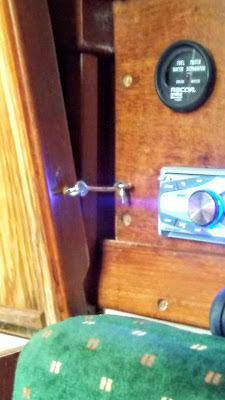 He also epoxied a piece of wood to the back of the battery area to mount a new shunt (came with Victron battery monitor) and Blue Sea 4-stud busbar. If you notice in the photo above, we had our charger installed on the right side of our nav station. When installing our new batteries, we needed to tie everything together .. the alternator, regulator, battery switch & battery charger. These items had come with the boat, and we needed to make sure they worked properly. Our main concern was our battery charger, as it seemed really old and sometimes got pretty hot. With about $800 invested in new batteries, we were stressing over the charger and if it would fry our investment! While moving forward with the battery installation, we kept wondering about our charger .. more about that in a bit. Now that we'd decided on our batteries, we learned from Nigel Calder's book that the battery cables should be as short as possible, and the same length. We also needed to determine the size of the wires & connectors for the cables, and then either make them ourselves or order them. 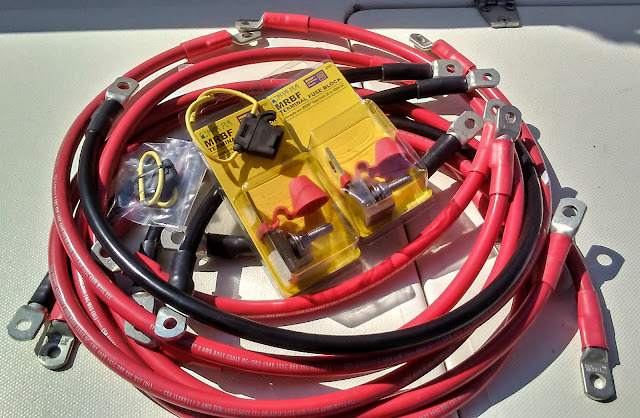 Since we're doing so many projects ourselves, we decided to pay a little extra & order the cables online at BestBoatWire.com. We chose #2 AWG tinned marine grade wire along with heavy wall tinned copper lugs and heat shrink. We also ordered some fuse blocks for terminal fuses & blade-style fuse in-line holders. We spent just over $200 bucks, and our order was shipped the next day! To protect the separate battery bank, we purchased the Blue Sea's SI-ACR, an automatic charging relay with a start isolation. This little device automatically connects our batteries when charging, isolates our batteries when discharging, and temporarily protects the house bank during engine cranking (optional, which won't work with our battery switch). The ACR is the little black and yellow box to the left of our charger. 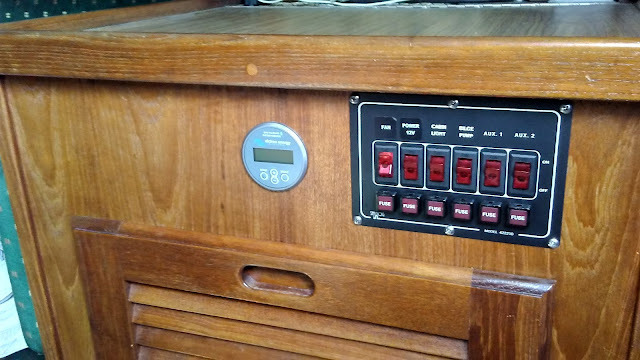 Another piece of original equipment on board was our Guest "Smart Switch", which we wanted to find more information about. Luckily, we were able to find the owner's manual in a binder left behind by Nirvana's previous owners. The switch has always seemed to work fine, so we decided to keep it .. money saved! Then there was the alternator regulator .. a Xantrex 150 amp. After contacting the manufacturer, we were able to get the owner's manual emailed to us. The internet makes things so much easier! We felt good about our alternator regulator, and also decided to keep it on Nirvana. Now that everything had been installed, it was finally time to install our new batteries! Ken made sure that they were all fully charged before installing them, and then put the two lower batteries inside of their strapped battery boxes. He attached the cables, fuse blocks and fuse holder, then the shelf was added. Ken cut the shelf in half to easily remove it when necessary. He also cut a hole in the shelf to connect one of the lower batteries in parallel to the two top batteries. Oops, gotta add some wooden strips to keep the two top batteries in place! Ken added the two batteries on the shelf and made his own battery trays out of plastic bins that he cut to fit. 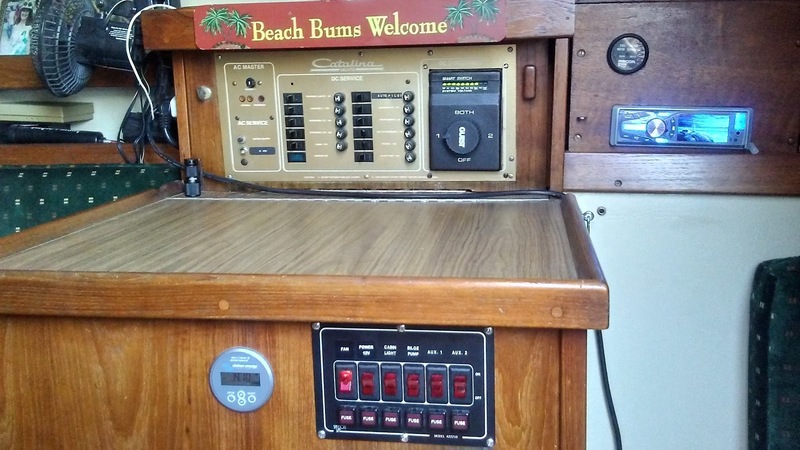 We finally had our new batteries hooked up, along with our new Victron monitor and ACR .. we're ready for our "beach bum" friends! Since this was such an important and rather expensive project, we decided to pay a marine electrician referred by our local West Marine to look over everything. He checked Ken's battery installation, as well as our alternator, regulator, wiring, and connections. We were relieved to hear that Ken did a fantastic job and he didn't see any problems! I wasn't surprised, as Ken put a ton of thought and effort into this project. The mechanic did recommend that we heat shrink some wires near our engine, but that's easy enough! About a week later we decided we weren't quite finished .. we were going to buy a new battery charger. 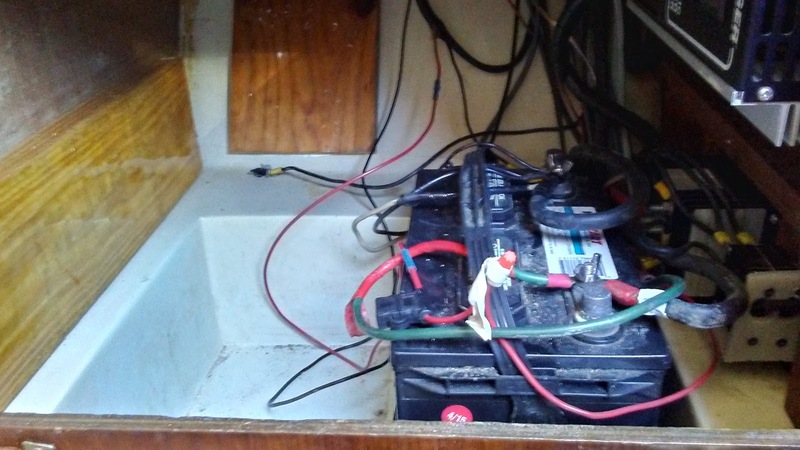 We found out (thanks to the folks at Charles Marine Group) that our battery charger was over 23 years old and no longer made. So, we decided that it'd be worth spending about another $300 on a new battery charger. 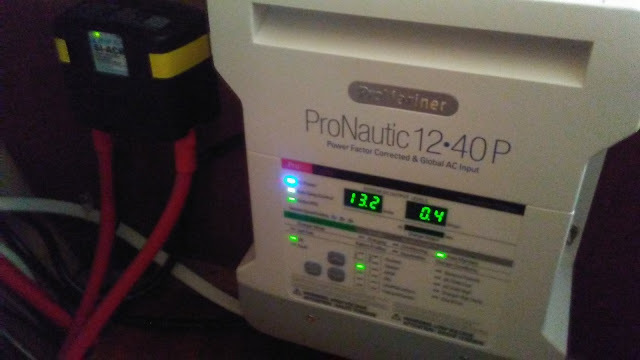 We decided to go with the ProMariner ProNautic 1240P charger. This 40 amp charger automatically charges, conditions and maintains the batteries based on the type of battery indicated .. in our case AGM. It's easy to check the status of the batteries at a glance, and I love that there's also a temperature monitor as well! Ken was aggravated with himself for not making this decision when installing everything, as he had to re-do a few things. But, once all was complete we were both glad that we no longer have to worry about our old charger. Now that this battery system is complete, it doesn't seem so bad. But at the time, it was a really stressful project for us! Finding a system that provided at least 100 usable amps and that could fit in our small space was tough .. not to mention learning about all the different components involved! As long as we have a boat, I have a feeling we'll never stop learning .. or being challenged. It's a real drag sometimes, but it's a good feeling when a problem is resolved. A quick tip if you have a navigation station like ours with a top lid .. add a little hook on the side to keep the lid open when working. Ken's a genius! Now that this project is done, we've got plenty of other projects waiting for us. We need to replace the lines on our traveler, boom & backstay with our new ones from Cajun Rope, add a couple of clutches & mid-ship cleats on deck, then add our sails & sail pack that have been in storage for way too long. We'll also be adding retracting lazy jacks .. and then we can sail again. It's been a long time! We've also got lots to research and buy .. solar panels (another fun installation with all of its components), a new bimini frame, a Mantus anchor, chain & rode, and a windlass to name a few. Oh, and we also have to install an auto-pilot and learn how to use our Lowrance chartplotter that we bought and stored a few years ago. Time flies when you're having fun! Pet peeves: amps is a rate. You can't have a battery capacity of 100 amps. It would be like saying that your cars gas tank capacity is 10 gal/hr. I suspect you're meaning "amp-hours." Good to clarify that is possible to help followers like me understand your capacities and consumption rates. Otherwise, very good write-up!